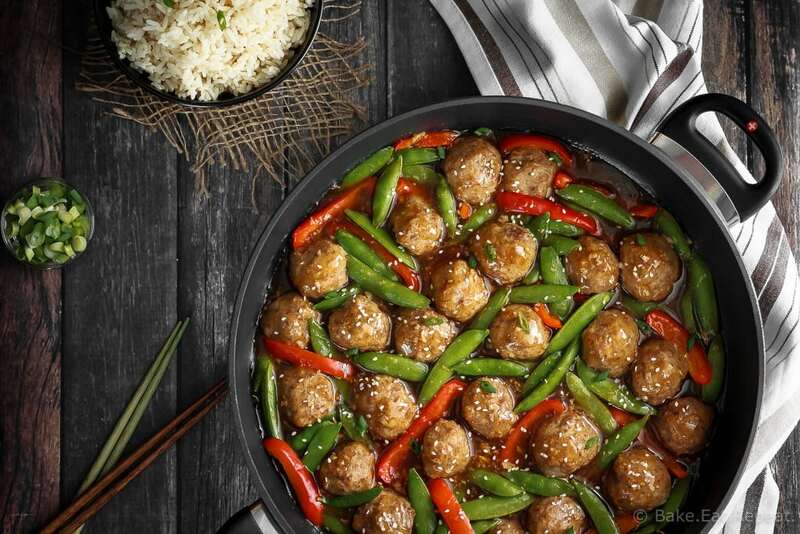 These honey garlic meatballs are easy to make and the whole family will love them! Serve over rice or quinoa for an easy and tasty meal! Anyone else’s kids go crazy for meatballs? Is that a universal thing, or is it just my kids? If I announce there’s meatballs for dinner, there’s actually cheering that happens. Although, when you get a cheering squad for your cooking instead of moans and groans it does make you want to repeat the meal in the very near future. They might be on to something. I do find it a little funny that they love meatballs no matter how they’re served. 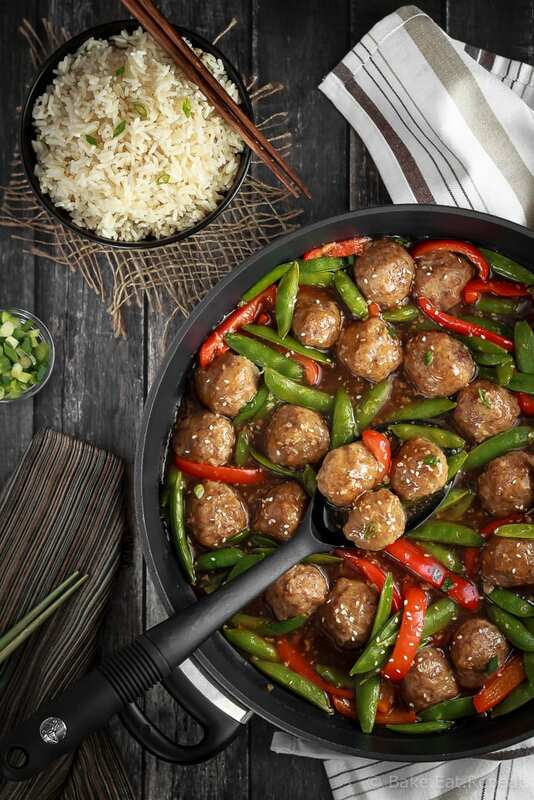 Spaghetti and meatballs (always more of a hit then spaghetti meat sauce – even though it’s almost exactly the same thing), these sweet and sour meatballs, this meatball souvlaki, or these honey garlic meatballs – they’re all gobbled up in a record amount of time. It makes me double the meatball recipe (or triple even!) every time I make them so that I can have some cooked and ready to eat meatballs sitting in the freezer for a very fast meal another night! I’ve been looking for a homemade honey garlic sauce that I like as much as the store-bought stuff for a very long time. I hate buying pre-made sauces when I know that it’s probably just a handful of ingredients mixed together that I already have. But I haven’t loved any of the recipes I’ve tried. This honey garlic sauce is great though, and I loved it as soon as I took my first bite. 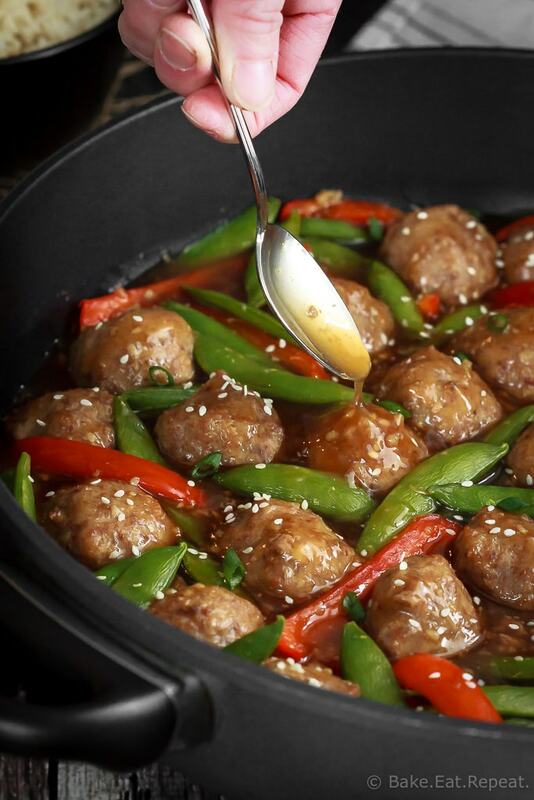 Coating some tasty meatballs and veggies in this honey garlic stir-fry sauce was just the obvious next step! Served over rice (or quinoa if you prefer), this made a fantastic meal. I was sad that there were no leftovers. Although I shouldn’t have been surprised, considering the meatball fanatics that my children are! Preheat the oven to 425 degrees F. In a large bowl, mix together the ground beef, ground turkey, egg, milk, breadcrumbs, onion, salt and Worcestershire sauce until well combined. Form the mixture into 1 1/2 tablespoon sized balls (I like to use a cookie scoop to make this faster) and place them on a rimmed cookie sheet. Bake for 15 minutes until cooked through (cut one in half to make sure there is no more pink in the middle). Meanwhile, in a medium bowl, whisk together the chicken broth, honey, brown sugar, soy sauce, garlic, and corn starch until well combined and set aside. In a large, non-stick skillet over medium heat, saute the red pepper and snap peas until softened, about 2 minutes. Add the sauce and bring it to a boil over medium heat, stirring constantly. Reduce the heat to a simmer and continue to cook for another 1-2 minutes until the sauce thickens. 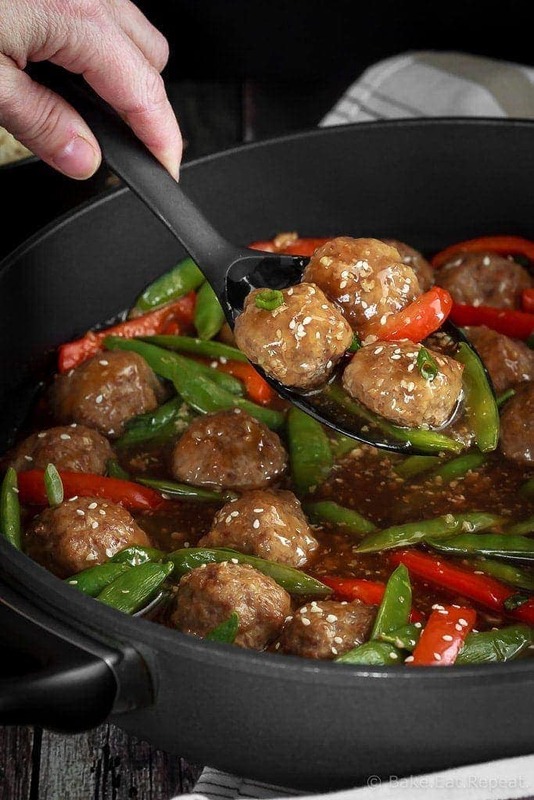 Stir in the cooked meatballs and let them simmer in the sauce for another minute, or until you are ready to eat. Serve over hot cooked rice or quinoa, sprinkled with green onions and sesame seeds if you like. You can use any combination of meat for this recipe. I usually use half ground beef and half ground turkey but all of one kind would work just fine too. This meal freezes well once it's prepared if you make a double recipe and freeze half for a later meal. I always leave out the red pepper and snap peas if I'm freezing it and just add them in fresh when reheating though.